Matt Murdock tends to have awful luck, but things have been especially rough for him in the past couple years. His archenemy, Wilson Fisk, became the mayor of New York City, and he nearly died after being hit by a truck, an accident that has damaged the radar sense that replaced his vision. 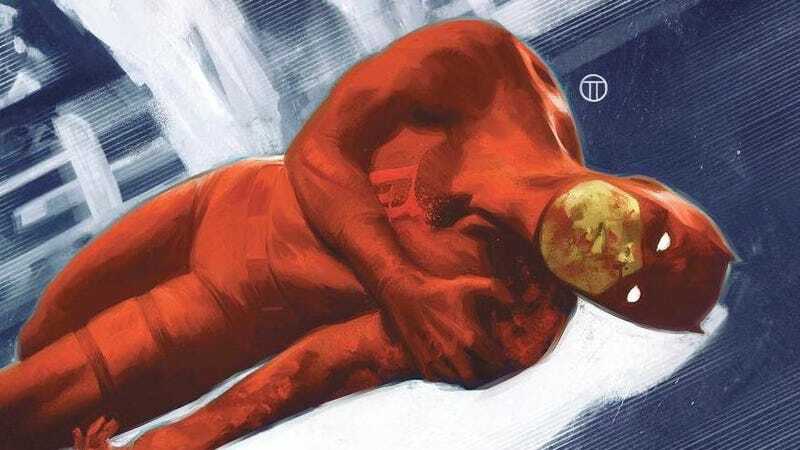 He’s back in his crimson superhero costume in the new Daredevil series, but now he’s faced with potentially causing the death of a criminal he took down in a routine street fight, flaring up his Catholic guilt as he tries to convince himself he’s being framed. Writer Chip Zdarsky, artist Marco Checchetto, colorist Sunny Gho, and letterer Clayton Cowles are delivering a highly atmospheric, introspective, and action-packed story in this title, hitting classic Daredevil beats while working with recent developments in the hero’s life to add new layers to the narrative. They’ve also given Matt a new foe in Detective Cole North, who has no patience for vigilantes and makes it his personal mission to take them off the streets, starting with Daredevil. This exclusive preview of next week’s Daredevil #2 has Matt in an especially compromised position after taking a bullet in the field, and this excerpt begins with Wilson Fisk delighting in the news that his long-time foe might actually be taken out once and for all. Of course, that’s not going to happen three issues into a new series, but the stakes are getting higher and higher for Daredevil with each chapter as new threats are thrown his way while he’s still struggling to get back on the superhero beat. Checchetto and Gho do fantastic work together, and they match the intensity and grit of Zdarsky’s story in the artwork. Gho matches the detail of Checchetto’s inking in his coloring while making bold palette choices that inform the storytelling, like coloring the floor of the ballroom in the first panel with a flat plane of deep red that reinforces Fisk’s connection to Daredevil. Matt’s body language clearly projects the pain he’s in after taking a bullet, and one of the best things about this series is how it emphasizes Matt’s suffering to make the reader understand just how hard it is to do what he does.